What can XPath do for me? XML is a formal model designed to represent an ordered hierarchy, and to the extent that human documents are logically ordered and hierarchical, they can be formalized and represented easily as XML documents. Computers can operate very quickly and efficiently on trees (ordered hierarchies), much more quickly and efficiently than they can on non-hierarchical text. This means that if we can model the documents we need to study as trees, we can manage and manipulate large amounts of data in a shorter time, and using fewer computer resources. XPath is a language for selecting parts of an XML document for subsequent processing. As such, the main thing an XPath expression does is allow the user to describe, in a formal way that a computer can process easily, certain parts of a document (e.g, all of the paragraphs , all of the first paragraphs of a section, unless the section is part of an appendix , etc.). In addition to defining specific parts of a document, XPath can also manipulate the data it finds (see the discussion of functions below), but the main thing it does is serve as a helper language, or ancillary technology, to identify parts of a document that will then be manipulated by another language. The principal XML-related languages that employ XPath to find information in XML documents are XSLT (eXtensible Stylesheet Language Transformations) and XQuery (XML Query language). We’ll learn about using XSLT and XQuery to manipulate XML documents later, but before you can do something with information in an XML document you have to be able to find it, and that’s what XPath does. This document provides some basic information about how to use XPath to describe, find, and navigate to information inside an XML document. For the most part you won’t yet be doing anything with the information you find, but once you’ve learned how to find it, you’ll employ that knowledge in subsequent lessons about XSLT and XQuery to interrogate and manipulate your source documents. The introduction you’re reading now is not a complete description of XPath, but it will get you started, and you can then find information about additional XPath resources in Michael Kay’s book. 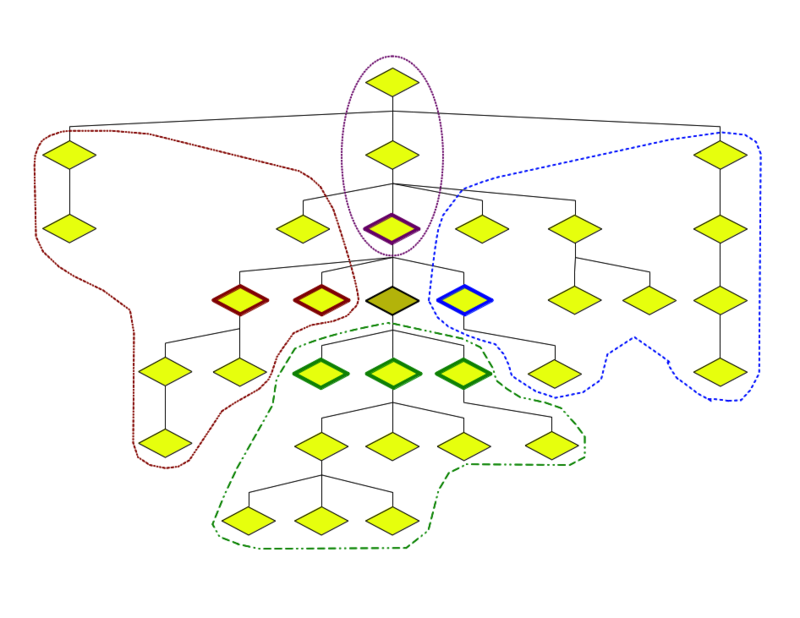 The <p> node contains just five child nodes. In order, these are a text node ( the node names ), the first <q> node, another text node ( and ), the second <q> node, and a third text node ( , which are ). Each <q> node contains a single text node, q for the first and code for the second. The tree is hierarchical. A node that contains another node is called its parent, so that, for example, the one <p> node is the parent of its five child nodes (text, the first <q>, more text, the second <q>, and still more text) and each <q> node is the parent of one text node. Nodes that have the same parent, such as the five children of the <p> node, are called siblings of one another. The tree diagram has been formatted to display siblings on the same level as one another, and the three text nodes directly under the <p> node plus the two <q> nodes are siblings. The two text nodes contained by the two <q> nodes are descendants of the <p> node, but not children. Although they are on the same level as each other, they aren’t siblings because they don’t share a parent. What we read on the web page as continuous text is actually a mixture of text nodes and element nodes, and the elements nodes, in turn, contain text nodes. The text may all appear continuous during rendering, but, as the tree shows, it lives at different levels of the hierarchy. The nodes of the tree are ordered. The child nodes of the <p> node, which are siblings of one another, occur in a particular order. This is why XML can be described as representing an ordered hierarchy of content objects. The group of nodes that an XPath expression returns is a sequence, which is a technical term for an ordered collection of items that permits duplicates. A sequence is not the same thing as a set because, according to the formal definition, the members of a set are unordered and cannot contain duplicates. The students enrolled in this course constitute a set insofar as there are no duplicates (nobody can be enrolled more than once) and they have no inherent order (one can organize them by height or alphabetically or in many other ways, but doing that doesn’t change the identity of the set). path expression Describe the location of some nodes in a tree. Find all <paragraph> elements in the tree. Given a <chapter> element in the tree, find all <footnote> elements inside it. Given a <chapter> element in the tree, find all <footnote> elements inside it that contain a <definition> element. This last expression requires a predicate, about which see below. axis Describe the direction in which one looks in the tree. An axis is part of a path expression. From a particular location in the tree, find all preceding <footnote> elements. Because we’re looking for preceding footnotes, the direction searched is backwards or left. From a particular <paragraph> element in the tree, find the <title> element of the <chapter> element that contains it. The direction searched is first upward in the tree (to the containing <chapter> element) and then downward (to the <title> element contained by that <chapter> element). predicate Filter the results of a path expression. Find the first <paragraph> element in each <chapter> element. XPath does this by finding all <paragraph> elements in each <chapter> element and then filtering out the ones that are not the first in their cohort. Find all of the <paragraph> elements that contain <illustration> elements, ignoring the ones that don’t. You aren’t trying to retrieve the <illustration> elements themselves; you’re using them to filter the set of all <paragraph> elements according to whether or not they contain <illustration> elements. function Do something with the information retrieved from the document instead of just returning it as received. Retrieve all of the <paragraph> elements in a <chapter> element (so far this is just a path expression) but instead of returning the actual elements, return just a count of how many there are. This uses the count() function. Retrieve a bunch of nodes that contain textual items (such as from a list) and concatenate their contents into a single string, inserting a comma and space after each one except the last. This uses the string-join() function. Path expressions are used to navigate from a current location (called the context node) to other nodes in the tree. By default, specifying the name of a node type in a path expression says to look for it among the children of the current context node. New steps in a path expression are indicated with slash characters (note: not back-slashes), and the context node changes with each step. This will be clearer if we walk step-by-step through some examples. Let’s assume below that we’re dealing with a prose document that consists of chapters, marked up as <chapter> elements, each of which contains one or more paragraphs, marked up as <paragraph> elements. The paragraphs, in turn, contain a mixture of plain text and quotations, marked up as <quote> elements. The path expression quote means collect all the <quote> child elements of the current context node. If one launches this path expression from within a <paragraph> element, it retrieves all of the <quote> elements immediately inside that <paragraph> element, ignoring any others in the document. This means that it ignores <quote> elements outside the <paragraph> element context node, and it also ignores <quote> elements that are inside other <quote> elements in the <paragraph> element, since those more deeply-nested <quote> elements are not immediate children of the <paragraph> (they are children of children). The path expression chapter/paragraph/quote means starting from the current context node, find all of the <chapter> elements that are its immediate children, then all of the <paragraph> elements that are children of those <chapter> elements, and then all of the <quote> elements that are children of those <paragraph> elements. Only the items returned by the last step in the path are added to the sequence to be returned by the path expression. In the preceding example, the system traverses <chapter> and <paragraph> elements on its way to find <quote> elements, but only the <quote> elements themselves are part of the value of the path expression, that is, of the sequence that the expression returns. The expression visits the other elements in passing, but it does not collect them. Slashes indicate stages in the path and the context node changes at each stage. Initially the context is wherever one starts (I’ll explain how that’s determined when we talk about how XSLT and XQuery use XPath), so in this example we begin by finding all of the <chapter> elements that are children of whatever element we’re in. Once we reach the first slash, the context node changes to the sequence of <chapter> elements that we just retrieved at the first step, so we’re now looking for <paragraph> elements that are children of those <chapter> elements. Another slash changes the context node yet again, this time to the sequence of all <paragraph> elements retrieved earlier, and we are now looking for <quote> elements that are children of those <paragraph> elements. Each step in the path is really defining a sequence of context nodes for the next step, and it then sets each one in turn as the new context node as it moves along the path. By default, the steps in a path expression are the names of element nodes. It is also possible to address other types of nodes directly, such as attributes and text nodes. This means that, for example, if all paragraphs are tagged with an attribute value describing their language (e.g., ... ]]>), one could find all of the language information on paragraphs by navigating to the paragraphs and then not to any element within them, but to the value of the @language attribute instead. Assuming paragraphs are inside chapters, which are inside a root <novel> element, that path expression might look like /novel/chapter/paragraph/@language. See below for an explanation of the leading slash. As is also explained below, in XPath a leading at-sign (@) identifies an attribute, and we’ll use one from now on when we talk about attributes in XPath, but the attribute name in the actual XML is written without the at-sign. As stated, this path would not retrieve the paragraphs in a particular language; it would retrieve the @language attributes, the values of which are the names of the languages. It is, of course, possible to retrieve all paragraphs (<p> elements) only if they are in English (for example) instead, but that isn’t what this particular path expression does; this path expression retrieves the @language attribute nodes themselves. By default a step in an XPath looks for an element that is a child of the current context node. As was noted above, it is possible to specify other types of nodes than elements, and it is also possible to look for nodes that are not just children, but also, for example, parents or siblings. XPath is capable of navigating from any context to any other location in the tree. child: All nodes contained directly by the current context node. descendant: All nodes contained directly by the current context node, recursively, that is, all the way down the tree. In other words, the descendants of a node are its children, its children’s children, etc. parent: The node that contains the current context node. Within the social metaphor of the XML family, children have only one parent. The only node that does not have a parent is the node at the very top of the tree (above the root element), called the document node. ancestor: The parent of the current context node, its parent node, etc., all the way up to the document node. preceding-sibling: All nodes that share a parent with the context node and precede it in document order. In the list you’re reading now, the preceding siblings of the current list item element are the other elements that precede it and have the same parents, which means the other list items that precede it in this list, but not those that follow it and not those that may precede it elsewhere in the document (since they have different parents). preceding: All nodes that precede the current context node in document order. This includes both preceding siblings and preceding nodes that are not siblings. Note that preceding must be understood in terms of nodes in a tree, rather than tags in a serialization. For this reason, ancestors are not preceding; although they begin before the current context (their start tag precedes it), the node itself doesn’t precede the current context because it is still open. That is, the start tag precedes the current context, but the element contains it, rather than preceding it, and XPath cares about elements, not tags. following-sibling: All nodes that share a parent with the context node and follow it in document order. The mirror image of the preceding-sibling axis. following: All nodes that follow the current context node in document order, including both following siblings and following nodes that are not siblings. The mirror image of the following axis. These eight axes fully describe looking in any direction from the current context node (there is also a self axis, which stays at the current context node, and a few others that also aren’t used much). There is no sibling axis; if you want all siblings, regardless of direction, there are a couple of ways to express that, but there is no way to do so with just a single axis. A step in a path expression actually contains not just the name of an element type (or other node specifier; one can specify things other than elements), but also an axis. We often don’t think about the axis because when no axis is specified explicitly, a default child axis is assumed, but the child axis is present, even if only implicitly, when no explicit axis is specified. An axis is specified by taking its name followed by a double colon and prepending it to the element name (or other path step). For example, a path paragraph looks for <paragraph> elements on the child axis, while preceding-sibling::paragraph looks instead for <paragraph> elements that are preceding siblings. This means that paragraph as a step in a path by itself is short-hand for child::paragraph. Usually nobody specifies the child axis, since it’s implicit when it isn’t stated. In addition to specifying the name of a specific element, one can look for any and all elements on an axis by using an asterisk (*). For example, the path paragraph/* means find all the child <paragraph> elements of the current context and then find all of the child elements of those <paragraph> elements, regardless of element type. The asterisk can be used on other axes, as well, so that preceding-sibling::* means starting at the current context node, find all preceding sibling elements, regardless of element type. The notation single dot (.) refers to the current context, and is equivalent to self::*, that is, all of the nodes on the self axis, which is the one current context element, whatever it is. The notation double dot (..) refers to the one parent node, whatever it is, and is equivalent to parent::*. A slash (/) normally indicates a step in a path expression, telling the system to look for whatever follows with reference to the current context. This means that, for example, paragraph/quote means find all of the <paragraph> elements that are children of the current context and then (slash = new step in the path) all of the <quote> elements that are children of each of those <paragraph> elements. A slash at the very beginning of a path expression, though, has a special meaning: it means start at the document node, at the top of the tree. Thus, /paragraph means find all of the <paragraph> elements that are immediate children of the document node, a query that will succeed only if the root element of the document (the one that contains all other elements) happens to be a <paragraph> (and therefore immediately under the document node). A double slash (//) is shorthand for the descendant axis, so that chapter//quote would first find all of the <chapter> elements that are children of the current context and then find all of the <quote> elements anywhere within them, at any depth (children, children’s children, etc.). When used at the beginning of a path expression, e.g., //paragraph//quote, the double slash means that the path starts from the document node, at the top of the tree, and looks on the descendant axis. The preceding XPath expression therefore means starting from the document node, find all descendant <paragraph> elements (= all <paragraph> elements anywhere in the document), and then find all <quote> elements anywhere inside those <paragraph> elements. This is one way to find all <quote> elements anywhere inside <paragraph> elements at any depth, while ignoring <quote> elements that are not inside <paragraph> elements. Attributes are not children and are not located on the child axis. Instead, they are located on their own attribute axis. The attribute axis can be specified as attribute::, but it is usually abbreviated as an at sign (@). For example, the path expression paragraph/@language, which is short for child::paragraph/attribute::language, starts at the current context, finds all of the <paragraph> elements on the child axis, and then finds the @language attribute on each <paragraph> element. If a <paragraph> element doesn’t happen to contain a @language attribute, nothing is added to the sequence for that particular <paragraph>. Curiously, although attributes are not children (they are not located on the child axis), they do have parents, which are the elements to which they’re attached. This means that in the preceding example, although the @language attribute is not a child of the <paragraph> element (because attributes by definition are not children, they are located on the attribute axis, rather than the child axis), the <paragraph> element is nonetheless a parent of the attribute, and is found on the parent axis when the current context node is the attribute node itself. One can specify all of the attributes of the particular context node (which must be an element for this to make sense, since only elements can have attributes) with @* (short for attribute::*), so that paragraph/@* navigates to all of the <paragraph> elements that are children of the current context node and then to all of the attributes of any type that are associated with each of them. In addition to specifying elements and attributes by name, one can specify text nodes as text(), so that, for example, paragraph/text() navigates first to the <paragraph> elements that are children of the current context node and then to all of the text nodes that are its immediate children. Similarly, one can use the shorthand notation node() to refer to all types of nodes together. For example, paragraph/node() first finds all of the <paragraph> elements that are children of the current context and then all of the nodes of any type that are children of those <paragraph> nodes. Remember, though, that since no axis is specified explicitly before node(), the child axis is implied. This means that node() refers to elements and text nodes, but not attribute nodes, because attribute nodes are not found on the child axis. Suppose we use the path expression p//* to find all of the elements of any type (thus the asterisk) anywhere (thus the double slash, which means descendant axis) inside a <p> element (that is a child of the current context). The preceding example shows one such <p> element with all of its descendant elements numbered in document order. Their type is not specified because this particular path expression is looking at all descendant elements, without checking their type. Because XPath document order is depth first, the processor looks down and to the left and finds the first element to add to the sequence to be returned, which is #1. But what should the second element in the sequence be? In a depth first system, like XPath, before the processor looks for the siblings of #1, it looks to see whether #1 has any children, and if so, it goes there first, so the next element it retrieves in #2. Since #2, in turn, has children, the system then gets #3. Because #3 doesn’t have children, the system then looks to the right, where it finds #4. At that point it has hit a dead end, with no children and no following siblings. It therefore backs up to the most recent place where it turned down, which is #2. Since the system has already visited the children of #2 (#3 and #4) and #2 doesn’t have any following siblings, it backs up again, this time to #1. It has already visited its children (it has only one child, #2), so it looks to its following siblings and finds #5. Before it continues scanning other siblings, though, it notices that #5 has a child, #6, so it heads there next, etc., traversing the tree according to the numbering above. The chart is a formal representation of how to do something. In this case, that something is traversing a tree in depth-first order. Ellipses represent termini (start and end points). Arrows represent steps in the process. They can either be absolute (what you always do, e.g., you always go from the start point to looking for a child node) or conditional (depending on whether a test succeeds or fails, about which see below). Absolute steps are unlabeled. Conditional steps are labeled to indicate the condition under which you follow them. Diamonds represent tests, which in this chart can either succeed or fail. Each diamond has two labeled arrows emerging from it, telling you where to go depending on the outcome of the test. For example, if you’re trying to get a new child node and you succeed in doing that, you then try to get its first child node, represented by the looping Succeed arrow. If you fail because there are no children (either none at all or none that you haven’t already visited), you follow the Fail arrow instead and try to get a sibling. This chart has one starting point and one stopping point, and you always wind up at the stopping point. Try to visit any children of the current context node that you haven’t visited yet, starting with the leftmost. On the flow chart, this is the decision step labeled Get a new child? If that attempted visit succeeds, you add the node to the sequence you’re building and it becomes the new context node, so now try to visit its children. This is shown in the flow chart as looping on success (that is, if you find a child, you then look at its children). If your attempt to find an unvisited child fails, look right to see whether there are any following siblings. If there are, visit the closest one, which becomes the new current context node, and then start looking at its children, following the steps of this procedure. If there are no unvisited children (step #1 in the flow chart fails) and no following siblings (step #2 fails), try to back up the tree to the parent to see whether it has any unvisited children. If so, visit them, following this procedure. If not (that is, if step #1 fails after you’ve backed up), check for siblings of the parent(step #2). Whenever checking for siblings fails, keep backing up. If you back all the way up to the document node (which doesn’t have a parent) and there’s nobody left to visit (that is, when step #3 fails), you’re done. Starting from the current context element, the elements on the preceding axis (preceding::*) are those with end tags that precede the start tag of the current context element. If the end tag of an element precedes the start tag of the current context element, it means that the entire other element must precede the current context. Conversely, the elements on the following axis (following::*) are those with start tags that follow the end tag of the current context element. If the start tag of an element follows the end tag of the current context element, it means that the entire other element must follow the current context. Because the last item in a sequence is often particularly useful, but its numerical value may vary, XPath provides a special pseudo-numerical predicate: //chapter/paragraph[last()] will retrieve the last paragraph of each chapter, without your having to tell it how many paragraphs there are. Nodes are counted away from the current context node, which means that with axes that travel up (ancestor) or left (preceding-sibling, preceding), the first node is the one closest to the current context node, etc., as if one were traversing a depth-first sequence backwards. You can find illustrations of numbered traversal on different axes on pp. 609–12 of Michael Kay’s book. Predicates are expressed by putting them in square brackets after the step in the path expression to which they apply, and it doesn’t have to be the last step. For example, //chapter/paragraph finds all of the <chapter> elements anywhere in the document and keeps just the first of them, and it then gets all of the <paragraph> elements that are children of that particular <chapter> and keeps just the second of them. Any expression in square brackets that filters a step in a path expression is a predicate. Numerical predicates are the easiest to understand, since they test simply for the location of an element in a sequence returned by a depth-first traversal of the tree. More complex predicates use functions, described in the next section. Functions operate on the information returned by a path expression or another function. For example, the path expression chapter/paragraph finds all of the <chapter> children of the current context and uses them to find all of their <paragraph> children. If you don’t need the actual paragraphs, and you just want to count them, you can use the count() function, so that chapter/count(paragraph) means that once you’ve made it to the chapter, you should return not the paragraphs themselves, but just a count of them. This XPath expression will return a sequence of number values, giving the count of the number of paragraphs in each chapter (that is, a count of the number of <paragraph> elements inside each <chapter> element). Note that this expression is different from count(chapter/paragraph). The latter expression returns only one number because it defers counting until it has retrieved all of the paragraphs inside all of the chapter elements that are children of the current context. The first expression, on the other hand, counts separately inside each chapter. The difference is that the two use the count() function at different steps in the path expression. There are two steps (find the chapters, and then for each chapter find the paragraphs), and one can count at either point. XPath has a little more than one hundred functions, but in practical projects you’ll rarely needs more than a couple of dozen, which you’ll learn quickly as you start using them. Don’t try to memorize them all, but do read over the full list periodically, without trying to memorize it, just to remind yourself of what’s available, so that you can look it up as needed. There are organized lists of all of the XPath functions at https://www.w3schools.com/xml/xsl_functions.asp and detailed discussion with examples in Michael Kay’s book. Functions can be nested. For example, there is a string-manipulation function to convert all text to lower case and a different function to normalize the white space (spaces, tabs, new lines, etc.) in text (the rule converts all white space to plain space characters, reduces all sequences of white-space characters to single spaces, and removes all leading and trailing white space). If you want to retrieve a set of values and perform both of these functions, you can nest them: normalize-space(lower-case(.)). This means take the current context node (represented by the dot), convert any text in it to lower case, and then take the output of the lower-case() function and normalize the white space in it. You can use functions in predicates to filter expressions. For example, if you want to retrieve all of the chapters that consist of just a single paragraph (perhaps as part of proof-reading; if they consist of a single paragraph, perhaps they shouldn’t have been independent chapters in the first place), you can do that with //chapter[count(paragraph) eq 1]. This says first find all of the <chapter> elements and then filter them by saving only the ones where the number of <paragraph> elements they contain is equal to 1. Note that the <paragraph> elements in question are on the child axis because that’s what’s implied whenever no axis is specified. You can also apply sequential predicates. Suppose you want to find all first paragraphs of chapters that contain more than a hundred characters. XPath provides a string-length() function that returns the length of text by counting characters. When it does this, it operates on the string value of the element, which is the total count of all textual characters anywhere inside it, no matter how deeply they may be nested. In other words, if a paragraph contains a mixture of plain text and, say, <quote> elements, the string-length() function, when applied to that paragraph, will count equally the textual characters directly inside the <paragraph> element and those inside the <quote> elements that may be inside the <paragraph> element. The XPath to specify all first paragraphs of chapters only if they contain more than a hundred characters is //chapter/paragraph[string-length(.) gt 100]. This says find all of the <chapter> elements anywhere in the document, then find their child <paragraph> elements and select only the first ones. Then filter those by selecting only the ones whose string length is greater than 100, that is, that contain more than 100 characters. The dot in the string-length() function here refers to the current context node, which became a <paragraph> element at the step of the path expression that specified paragraph. Note that retrieving the first paragraphs of all chapters only if they contain more than 100 characters is not the same as retrieving, for all chapters, the first paragraphs that contain more than 100 characters. The first of these tasks will return nothing for chapters where the first paragraph fails to contain more than 100 characters. The second will return nothing for a chapter only if none of its paragraphs contains more than 100 characters, and you could write it as //chapter/paragraph[string-length() gt 100]. The way this expression operates is that it finds all chapters in the document, and then, for each chapter, it finds all of its paragraph children. It filters those paragraph children by keeping only the ones longer than 100 characters, and it then keeps only the first of the paragraphs that survive that filtering. The two expressions, //chapter/paragraph[string-length(.) gt 100] and //chapter/paragraph[string-length() gt 100], return different things because the predicates are applied in order, from left to right. axis Path direction and scope, e.g., ancestor, preceding-sibling. depth-first order See document order, below. document node The node that serves as the parent of the top-level, or root, element. The document node is the only node of any type on an XML tree that does not have a parent node. document order XPath traverses the tree in depth-first order, which means that it visits nodes in order and looks at a node’s children before it looks at its following siblings. function Operation that can be performed on the result of a path expression, e.g., counting the number of nodes and returning just the count instead of the nodes themselves. node Part of an XML document. The most important types of nodes are element, attribute, and text(). path expression The way to reach the nodes you care about. Path expression may have multiple steps, separated by slash characters. predicate A filter applied to the results of a path expression, specified in square brackets. root element The element that contains the entire document. The root element is actually the child of the document node. sequence An ordered collection of pieces of information. One example of a sequence is the nodes singled out from the tree in document order by an XPath expression. // descendant axis descendant::. At the beginning of a path expression, it means that the path starts at the document node. Slash (/) indicates a step in a path expression. At the beginning of a path expression, it represents the document node.